Marina Rubicon - Villa 2 Bedroom - Minutes to the Sea Front, Pool, WIFI. Casa Paloma is a modern 2 bedroom villa located in Marina Rubicon area. Casa Paloma is ideally located just 2 minutes walk to the sea front, restaurants, shops and bars at the exclusive Marina Rubicon. The villa is located in a quiet area close to the Rubimar Aparthotel. with private patio, pool and sunbathing area offering the benefit of a central location and a peaceful setting. 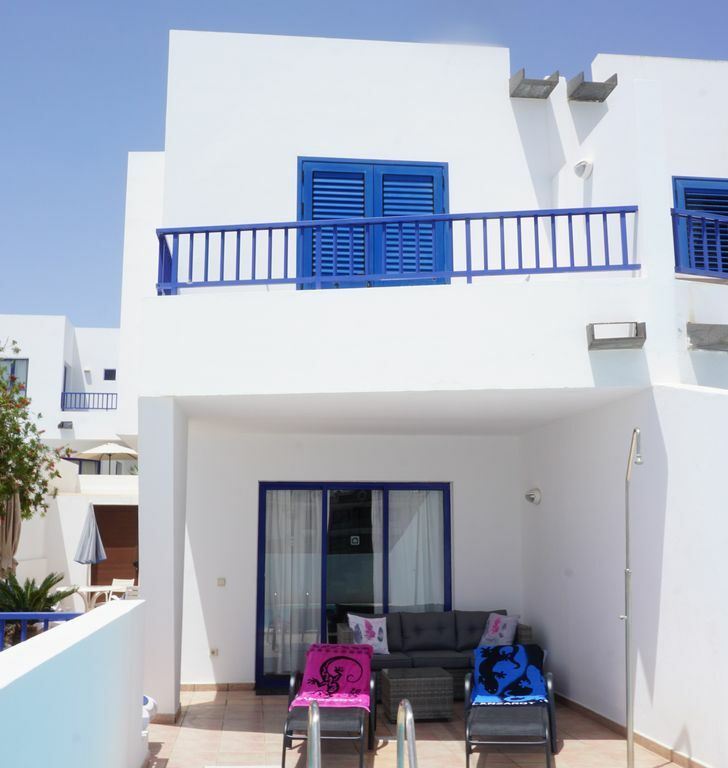 Casa Paloma is situated 2 minutes walk to the Marina and a ten minute walk along the scenic coastal path takes you to the nearest beach and the town centre of Playa Blanca with a wide range of bars and restaurants is approximately 25 minutes walk. The Papagayo beaches are a short drive away. Inside there is an open plan living area with modern furniture, comfortable sofa and dining area for 4 people. There is internet TV offering a wide range of English TV channels and free Wi-fi. Patio doors from the lounge open out to the south facing pool area with a covered seating area and sunbathing with access to the pool. The pool has a solar pool cover to help maintain the temperature. To the side of the property there is additional sunbathing space, barbecue and table and chairs for eating outside. There is a separate shower room and toilet on the ground floor offering additional space and convenience for families. The well-equipped kitchen includes an oven, hob, microwave, dishwasher, washing machine, fridge/freezer, kettle and toaster. The kitchen leads out to a utility area with washing machine, iron and ironing board and clothes drying space. The large main bedroom is light and spacious and perfect for couples there is a large double bed with memory foam mattress, built in wardrobes with plenty of storage, bedside tables, mirror and hairdryer for convenience. Doors open onto the balcony with views over the Marina and swimming pool. The comfortable second bedroom has built in wardrobes and additional storage ideal for children or friends to share. The beds can be arranged together to make a large double if required. There is a light spacious family bathroom with shower over bath, toilet, bidet and double sinks with full width mirror and spotlights. The main benefit of the villa is the private and relaxing environment with the convenience of being only 50 - 100 m from the Rubicon Marina and the coastal path. The villa is perfect for couples and small families wishing to enjoy a peaceful holiday in a convenient location. The villa also benefits from a private parking space, safe and a monitored alarm system. Our family have been visiting Lanzarote for over 20 years and now have our own property on the island. We are happy to offer advice and suggestions to make your stay more enjoyable. Casa Paloma is well furnished and modern and has all the facilities needed for a relaxing and peaceful holiday within walking distance of all the facilities of Playa Blanca. The villa is well equipped and has everything you need for enjoyable stay including free wifi and full IPTV package. There is a 24hr monitored alarm system for security and private pool with solar heated cover. The villa is in a perfect location to enjoy the beaches, restaurants, bars and shopping whilst offering a relaxing environment. Fully equipped kitchen with oven.hob, dishwasher, fridge, freezer, microwave, Kettle & Toaster. Pool not heated but has solar pool cover - pool will be very warm during summer months. Although the property is in a quiet and safe location we have installed a monitored alarm system which can be activated as required for your security. there is also a safe for you valuables. Fabulous villa in a perfect place! This was our first proper villa experience. We've stayed in apartments a few times and to be honest we're of an age where we enjoy a bit of hotel pampering. But last year we stayed in Playa Blanca on half board for 2 weeks and I really felt I was eating for the sake of it. My husband initially thought 1 week would be enough but I stuck out for 2 and we have no regrets! Casa Paloma lived up to all our expectations. We were very familiar with the Marina area and it's perfectly placed within minutes' walk from everything. We didn't have wall to wall sunshine and it was just great to make a coffee and sit indoors when it wasn't so nice. The villa is well-maintained and decorated, and has lots of natural light. Any issues we had were dealt with very promptly by the management company who can't be faulted. My husband was particularly happy to meet Steve - a fellow supporter of Birmingham City! We ate out most evenings but breakfast and lunch were easily prepared in the bright kitchen and there was an outside table too. And a very welcome parasol! The pool was cool (!) but on the warmer days the sun soon got to work on it. Our adult son soon found his favourite spot on the outside sofa and if he hadn't had to eat I think he wouldn't have moved! I honestly thought my self catering days were behind me but Casa Paloma has changed all that. We hope to visit again soon as Playa Blanca (and Marina Rubicon in particular ) is fast becoming a favourite destination. Thanks to Helen too for answering all our pre holiday questions! My husband and I stayed for a week from 02.02.18 and had a wonderful time. The property is very spacious a real home from home. Location was fabulous the beach being within walking distance and lots of lovely eateries all around. The only negative was the time went far to quickly and we could of stayed forever. Just perfect. Comfortable, well maintained and well equipped property in excellent location. Thank you for your lovely review. We do hope to get pool heating for the winter months in the future. If you stay again during the summer months I think you will be surprised by how warm the pool gets with the solar cover. So pleased you all had a great holiday! We couldn’t have been happier with the location of the villa. A two minute walk to the supermarket and a lovely little coffee shop and a five min walk from Marina Rubicon with nice shops and restaurants. A welcome pack was left for us with milk, beer, wine, water,tea and coffee and the management company were brilliant with a couple of little issues we had. The villa had everything we needed and was a sun trap in the afternoon. Internet tv meant we could keep up with our British programmes!! We are hoping to rebook for next year! Thank you for your great review glad you enjoyed the villa and hope you will stay again soon.